Guided mode is a marvelous editing feature in Photoshop Elements. To access Guided mode, click the Guided tab near the top of the Photo Editor workspace. The Guided Edit mode is not a new feature in Elements, but you do find a completely new user interface when you click Guided at the top of the Photo Editor window. 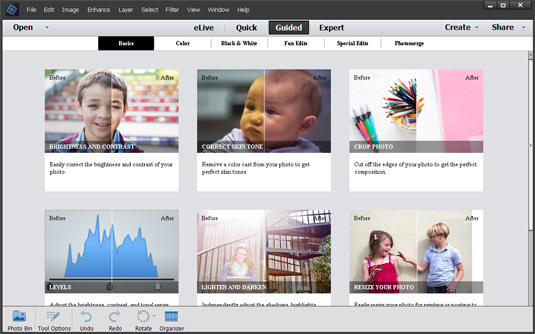 Guided Edit mode, as the name implies, is a guided process for performing various editing tasks. When you open the Guided panel, you find a new view for the various categories of Guided Edits. Click one of the items in the top row where you see Basics selected. The various edits are grouped together in different categories as you see when you click a category item at the top of the Guided window. Click the Guided tab to open the Guided Photo Edit panel. Not all editing tasks are contained in the Guided panel, but what you have available is an impressive list of many tasks you perform often. Speed helps you easily add some motion blur to your photos. 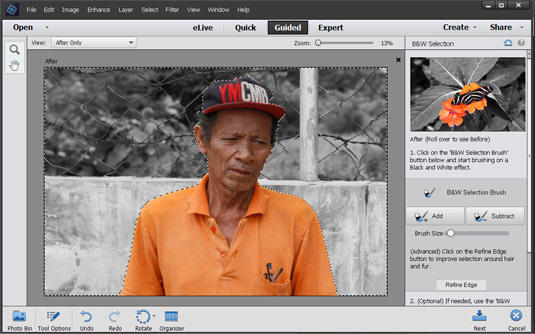 Extract walks you through the process of extracting an object out of your photo. Resize walks you through resizing a photo. Some items, such as Picture Stack, require using multiple images. Load up the Photo Bin with photos and apply the effects to multiple images. You have effects that can help improve images that might otherwise be uninteresting photos. Experiment with the Lomo effect (which is similar to cross-processing film), Old Fashioned Photo effect, Saturated Film effect, and Depth of Field effect. For a new creative experience, use the Puzzle effect that was introduced in Elements 12 or some of the new Guided Edits that were added in Elements 13, such as the Noir effect. For some creative experience, you can easily convert a portion of an image to black and white while leaving some of the image area in color. Using Guided Edits the task is easy and intuitive. The B&W Selection is a marvelously easy edit that you can apply to any photo.